UPDATED – WASHINGTON (CNS) — Three U.S. Catholic bishops Dec. 18 joined their voices in mourning the death of a 7-year-old Guatemalan girl shortly after she crossed the U.S.-Mexico border with her father and they turned themselves in to U.S. Customs and Border Protection seeking asylum. The girl, who was identified by the Guatemalan government as Jakelin Caal, died the first week of December. 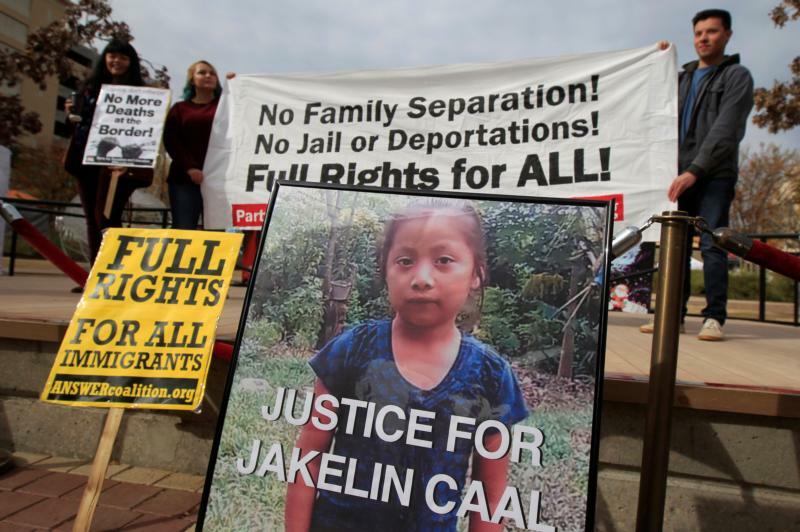 “Our prayers and heart-felt condolences go out to Jakelin’s family. The death of a child is always a moment of great sadness, a jarring disruption of the natural order of life,” the bishops said in a joint statement. “From this tragedy, we must remember this profound human consequence of our failed immigration policies, including also that restrictions on the flow of asylum seekers at the border can push more families to seek entrance between ports of entry which place them at greater risk,” they said. The statement was issued by Bishop Joe S. Vasquez of Austin, Texas, who is chairman of the U.S. bishops’ Committee on Migration; Bishop Mark J. Seitz of El Paso, Texas; and Bishop Gerald F. Kicanas, administrator of the Diocese of Las Cruces, New Mexico. “Jakelin’s death is a tragic reminder of the desperate situation that many fleeing violence, persecution, and poverty face — both in their home countries and now at our border,” they said. The Washington Post reported that the girl and her father, Nery Caal, 29, were taken into custody Dec. 6 around 10 p.m., south of Lordsburg, New Mexico. They were among 163 migrants who turned themselves in at the border. “Some seven hours later, she was put on a bus to the nearest Border Patrol station but soon began vomiting (and having seizures). By the end of the two-hour drive, she had stopped breathing,” the Post reported. Border Patrol agents administered CPR and she was flown to a hospital in El Paso, Texas, where she later died. Officials said the girl initially appeared healthy and that an interview raised no signs of trouble, according to the news story. Her father, who was described as Spanish-speaking in initial accounts, signed a form indicating she was in good health, authorities said. Critics of the Border Patrol and the Trump administration said later that the girl’s father speaks a Mayan dialect that officials supposedly didn’t really understand. The Washington-based organization said it joined “in prayer for this girl’s family members who grieve her loss. “We also pray for all of those making the treacherous journey across the desert and are reminded of Abraham, Sarah, Mary, Joseph and countless others who made similar journeys in the light of hope,” it said in a statement issued Dec. 14, the day news reports circulated about the girl. The inspector general’s office in the Department of Homeland Security said Dec. 14 it would investigate the circumstances of the child’s death. “As we approach Christmas it is heartbreaking to consider there are many thousands of families in desperate need of the assistance of our nation,” the council added. “As a nation, we have the obligation to receive distraught individuals and families with welcome, compassion and humane treatment,” they added.